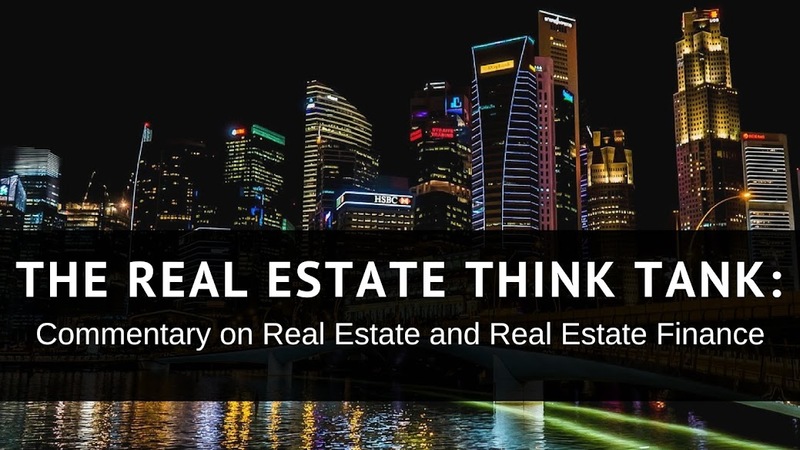 The Real Estate Think Tank: Commentary on Real Estate and Real Estate Finance: Lender’s Fees: How Should One Account For Them? Lender’s Fees: How Should One Account For Them? Lender’s fees are a fact of life in real estate acquisitions. I was recently reading a chapter in a real estate handbook that outlined the justifications of a number fees commonly associated with mortgage origination and it offered a number of options for reducing their amounts. The relative negotiability of each lender fee, however, depends greatly on the lender, the credit worthiness of the borrower, the size of the asset, the size of the down-payment and market conditions. Generally, the stronger the buyer, the larger the asset and the larger the down-payment, the more negotiable lender’s fees are. Below is a discussion of some of the most common lender fees and how to account for them. Prepayment Penalties: To tackle one of the most significant first, let’s discuss prepayment fees, ubiquitous in large commercial mortgages, and pesky in other types of real estate financing. I will eventually create a post that discusses the mathematical justification for prepayment fees and how to assess them from a lending stand point, so, I am not going to get into too much detail here. Prepayments can come in various forms, however the four most common are overpayment, refinance, sale of property and transfer of controlling interest in a corporation. Although I have not seen too many mortgages that are triggered by the transfer of controlling interest of a corporation, this technique is a very common way for businesses to sell a property without triggering any “due on sale” clauses. Many leases recognize such transfer as sales and require the tenants respond accordingly, however, I digress. Overpayment, refinance and property sales lead to a loss of interest carry for the lender. Typically, the total interest paid over the life of a 30 year mortgage exceeds 110% of the principal (the “cumipmt” function in Excel is an easy way to calculate the total interest paid over a period of time). In order to realize as much of the intended interest carry as possible and also discourage large borrowers from refinancing, many lenders impose prepayment penalties. The structure of these fees varies from flat fee penalties to percentages of the loan amount. Accounting for accumulating interest, these fees typically decrease with time. Generally, however, prepayment penalties should either be avoided or factored into the cost of exit. Their existence should necessarily drive up one’s return requirement. More on prepayment penalties at a later date. Lender Application Fees: Lenders typically charge an application fee for 3 reasons: to weed out applicants who are aware of their low credit worthiness, to cover the cost of vetting a potential borrower and to add to the fees garnered upon closing. Lenders that charge large application fees are typically more selective and should have better placement rates and financing options. Any lack of product variety and/or placement ease signals an unjustified application fee and should not be paid. These fees are not necessarily a bad omen, however, they should be refunded upon closing, given that they are simply barriers to entry. They also should be included with acquisition costs and discounted by the cost of money, if refunded. Origination Fees: Origination fee is an amorphous term that covers the costs of the lender or broker (in this market, we’re mainly speaking about lenders). Generally, they cover the lender’s administrative costs, legal costs associated with mortgage documentation and any other charges the lender will attempt to justify. These fees are typically 1% of the mortgage amount, exclusive of points. Unlike points, these items are not typically itemized on any of the documentation given to the borrower. There generally isn’t much discussion regarding origination fees during the loan process, however, I have never heard that these fees were not negotiable. One must consider, though that lenders consistently argue that without them, lending becomes an unprofitable pursuit. I have never given much credence to lenders’ claims that a reduction in origination fees will somehow render them bankrupt, however, in negotiating this item, it is important to remember that the lender must be compensated in some way for making the loan. Frequently the backend points given to lenders for driving up an interest rate are not enough to make the effort worthwhile. Additionally, one must be sure that all negotiated fees do not translate into a higher interest rate. This could lead to the lender paying more than was originally negotiated. Therefore, looking to obtain a loan at an optimum interest rate without paying any lender-related fees may not be the most realistic goal, however, many of these items still remain negotiable. Mortgage Points: Mortgage points can be helpful in a number of ways, but are not always in the borrower’s best interest. One must keep in mind that the purchase of 1 point today is the equivalent of paying 1% of the purchase price to reduce the mortgage rate by 25 basis points, or .25% over the life of the loan. This is a beneficial trade off if the cost of money is high or the holding period is long term, however in the short term, these points can be very costly, with the limit of the present value of a mortgage point tending toward $0.01 as periods become infinitely smaller. The resulting number should be a guideline not to be exceeded. This rate could be compared to alternative investments or to your own established rate of return to determine if the money spent on points should be allocated to other uses. Finally, the method that I use, requires me to find the total amount paid toward the mortgage at a given rate, using the “cumipmt” and “cumprinc” functions and set that answer as my future value of the loan without points. I then calculate the same value for a loan amortized at an interest rate less the conversion rate of basis points based on the amount of mortgage points that I intend to purchase. I take the difference of these two values and set that as the future value of my savings. I then find the present value of that difference and compare it to the cost of the points. I am sure to make the loan amount, cost of money, mortgage interest rate, amount of mortgage points purchased, number of periods and cost of points my inputs. It is crucial to set equal your number periods and end period in the cumulative functions. Also, compounding interest monthly by dividing all mortgage interest rates by 12 and multiplying all periods by 12 gives a clearer picture of the tendencies of all numbers as they either tend toward 0 or infinity. That is a brief overview of some of the ways to analyze the most common mortgage costs that arise during the loan application process. A more in-depth look at mortgage pre-payment penalties will come in the near future.